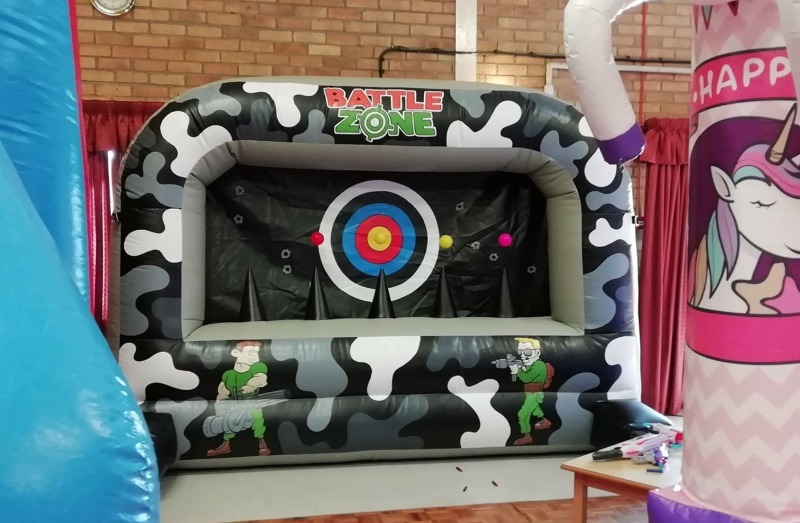 Our New Nerf Battle Shooting Range is available to Hire throughout Boston, Spalding, Sleaford, Horncastle, Donington, Tattershall, Coningsby, Pinchbeck, Wyberton, Gosberton, Kirton and all surrounding areas. This is a must for any nerf style birthday party, challenge your friends to a battle who can knock the most balls down!! Foam bullet guns seem to be extremely popular and we continue to look at ways to cater for as many style parties as possible to ensure your little ones have the best day! This nifty shooting range can be used with Foam bullet guns for children over 8 years of age, Foam ball guns for children over 4 years of age or water pistols which are great for the hot summer days. Suitable for Garden Parties or hall hires this is sure to be a real hit for any occasion. The shooting range has 5 jets which you place the balls above, the air then shoots through the jets keeping the balls afloat, then test your aim and skills to knock down the moving targets. We will supply you with safety goggle to ensure the children (or adults) eyes are protected, you will also be provided with either Foam Bullet Guns, Foam Ball Guns as well as foam Bullets/Balls or Water Pistols, when booking please specify which you would like to be provided with nerf guns, Foam ball gun or water pistols. All children MUST be supervised at all times to ensure the equipment is being used safely and correctly! AIM ONLY AT THE TARGETS NOT AT ANYONE's FACE OR BODY AS THIS MAY CAUSE UNNECESSARY INJURY! And we also advise age 6+ for the use with water pistols. Age 4+ for Foam Ball Guns - Not suitable for children under 4 years.